8 year old Yael is a shy, contemplative girl, living in her own private world. She prefers writing letters rather than joining in with her cousins and dancing to the delight of family members. She lives at home with her mother, while her rock star uncle is the only father figure around her. Her absent father works in Saudi Arabia to help support the family back home. Her only connection with him is the recorded cassettes he sends her mother, which she listens to secretly and incessantly. One day she sees a TV advert for a pen that can translate nervous thoughts, so she starts saving and sets out to find this ‘magic’ pen. 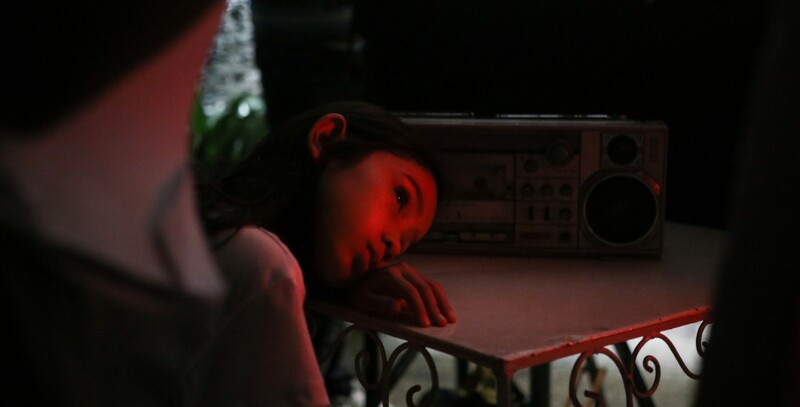 Based on Shireen Seno’s own experience growing up within the Filipino diaspora, Nervous Translation is a portrait of a common experience of many Filipino families, where only fragments of each other are seen and heard. The film is set in 1988, capturing a significant period in Philippine history, drawing connections to the present day through familiar issues: the complexity of the family unit in light of migration, an obsession with consumer electronics and personal technology, and the sheer power of nature to remind us of our limits and what really matters.